Ryan, rear-facing in Britax Elite. Ryan is 5 years old, 32 lbs (upper weight limit for the Elite) and stands about 41.5 inches tall. His seated height is 22 inches. Note that he sits cross-legged to "fit" in the seat, but is not unhappy or uncomfortable. Close up of Ryan in the Elite. Note that he has about 3 inches of "head room" left in the seat. 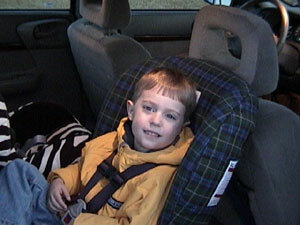 Until November 2001, when Ryan was 4 years and 10 months, Ryan used this seat rear-facing all the time. 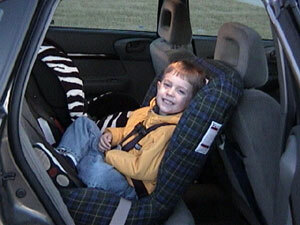 He outgrew the seat by weight (33 lbs) at about 5 years, 6 months.